Suits are great; they can make even the sloppiest of men look like a true gentleman (that’s probably why we’re forced to wear them at weddings). But when the bridal party has arranged an outdoor wedding where guests sit in the sun while the soon-to-be-wedded enjoys the shade, it’s not an easy task to look so calm and collected. Vishaal Melwani, Combatant Gentlemen co-founder and third generation tailor, understands the conundrum men face when donning a suit to a summer wedding. They want to appear as a dapper gent while feeling as if they’re dressed for the beach. Luckily, Melwani knows how to get gents looking their best no matter what the thermometer says. Pay attention to the feel of the suit being bought. It may have seemed like a good idea buying a heavy suit in November, but that good idea isn’t going to work in the heat. Melwani recommends a chino suit because they’re light and aren’t designed to keep the wearer warm, although you can wear it throughout the year (when it starts getting colder, pair it with a sweater). While Melwani says khaki is the best for summer weddings (like the style pictured above), you can purchase it in a more office appropriate color like navy, chocolate brown, and olive to get the most use. For those that have a little bit of extra money to spend, the best warm weather suits are going to be made of tropical wool. “They’re a little bit more of an investment if you want a good wool suit for summer weddings in particular,” says Melwani. Combatant Gentlemen will be releasing three tropical wool suits to their lineup next spring. Some men live and die by the undershirt, but when it’s not even the hottest part of the day and you could already fill a water bottle full of sweat, losing any layer is beneficial. “The cotton-on-cotton does add to the weight, and it does add to the heat,” explains Melwani. Be sure to stay away from poplin fabrics (in sunlight they can become see-through); stick with an oxford cloth or twill. If things just don’t feel right without an undershirt, check out what performance brands like Under Armor have to offer. Melwani has learned a few tricks over the years. Here are some that he feels will help men get to the after party without breaking a sweat. Apply talcum or baby powder to underarm areas, chest, or any other problem sweat areas. This may be obvious, but stay hydrated. Don’t start drinking alcohol until later in the day, when it’s cooler. 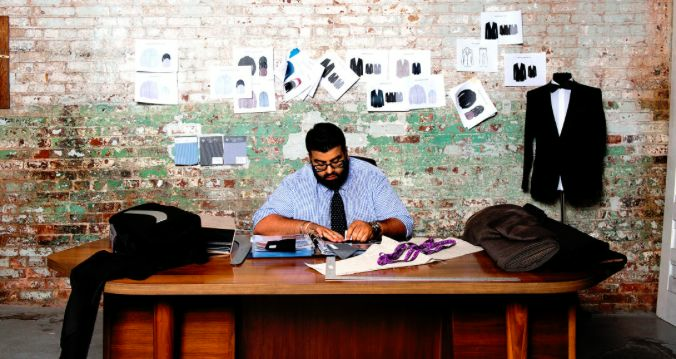 Vishaal Melwani, co-founder and CEO of Combatant Gentlemen still hones his tailoring skills. Mixing and matching colors is a bold choice, but “it represents your personality,” says Melwani. “It shows you’re trying to be more intentional with what you’re wearing.” That doesn’t mean caution should be thrown into the wind, it’s important to have some knowledge about color scheme. Some popular combinations he’s seeing are khaki and black, navy and black, and navy and burgundy. Pairing any of these combinations with a pair of black dress shoes and a knit silk tie is sure to turn heads. The current summer wedding pick is a khaki chino suit paired with a light blue shirt and a maroon or red knit tie. “It says a lot about how you want to pay homage to the past and the dandies of the world in terms of summer weddings,” he says. “But it shows that you understand the attire for the occasion too.” Keep those ankles bare—it’s summer after all—and grab a pair of no-show socks. Above all else, the most important thing is that the outfit says something about who’s wearing it. “Confidence is key no matter what you put together,” says Melwani.